Many of the children's advertising regulations in place today date from the 1970s, when TV was by far the dominant means of marketing to children.1 Since then, not only has the sheer quantity of marketing to children increased, but so has the variety of techniques employed.2 Some of these techniques are quite sophisticated and utilize psychological and neurological research. With the increased ability to collect and analyze data from and about consumers, advertisers can place highly targeted ads. Often marketing is hidden or disguised. Advertisers can create websites and games designed to get children to spend hours playing in a branded environment. This blurring is intentional because if consumers do not recognize something as an "advertisement," their defenses are lower. Young children lack the cognitive ability to distinguish between advertising and content. Yet, now more than ever, their favorite characters from movies and TV are used to market unhealthy foods. Marketers often enlist children and teens to unwittingly participate in viral marketing campaigns. An area of particular concern is the increasing commercialization of social networks such as Facebook and MySpace. With a new President, changes in Congress, new leadership at the FCC and the FTC, and widespread public concern about the rising costs of healthcare, the policy community has a unique opportunity to implement policies limiting the marketing of unhealthful foods to children and adolescents. Advocates should explore and strategically pursue a variety of approaches. This memorandum first suggests how the current approach to children's advertising should be updated. 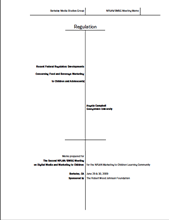 Next, it identifies some key criteria that need to be developed to have effective regulation. Finally, it identifies several options that could be pursued in the near future at the FCC, the FTC, in Congress and with industry. Changes in the nature of marketing and advertising require changes in the regulatory structure. First, regulations must cover all forms of marketing to youth, regardless of the medium involved, e.g. , TV, Internet, cable, satellite, motion pictures, mobile phones, packaging, point-of-purchase and promotions. Regulating TV alone will simply cause marketers to refocus their efforts on the Internet and other venues. Comprehensive regulation is difficult given current laws. The FCC's jurisdiction primarily focuses on broadcast TV, although ad limits and related policies apply to cable and satellite networks such as Nickelodeon and Disney. The FTC has jurisdiction over unfair and deceptive marketing practices on all types of media, but its effectiveness has been limited by its lack of authority to conduct informal rulemakings. Second, new regulation should directly address food marketing to youth. Childhood obesity has become a much greater problem in recent years. Yet, except for the FTC's unsuccessful attempt in the late-1970s to ban ads for sugared products3 , children's advertising regulations have been intended to prohibit unfair or deceptive practices, not to promote healthy diets. Legislation articulating the need to reduce marketing of unhealthy foods would be desirable. In the absence of legislation, expanding existing prohibitions to new advertising techniques, such viral marketing and behavioral targeting, could reduce the amount of food marketing somewhat, as a large proportion of advertising to youth is for unhealthy foods. Third, because of the sheer volume of marketing for foods of low nutritional value and the use of stealth marketing techniques (marketing that is not perceived as advertising), parents and children need to be educated about nutrition and how marketing works to better protect themselves from the adverse effects of the marketing of unhealthy food. The Institute of Medicine recommended that food marketers "should use their creativity, resources, and full range of marketing practices to promote and support more healthful diets for children and youth. "4 Other means such as funding social marketing or requiring counter-messages should be considered as well. Finally, it is important to recognize that advertisers and other industries that depend on advertising will resist any regulation. If regulations are adopted, they will challenge them in court. They will argue that public education and/or industry self-regulation are better and more First-Amendment friendly ways to address the problem of childhood obesity.5 In my view, no one approach will solve the problem of childhood obesity. We will need public education, industry self-regulation and government regulation. To be successful, any government regulation, or self-regulation, needs to 1) identify which products should not be marketed (or should be marketed less) to youth; 2) determine the ages above which youth no longer require special protections; and 3) define marketing to youth. Such definitions must not only further the goal of reducing childhood obesity but must be consistent across media, easy to understand and apply, and verifiable. It is also important to ensure that marketing communications to adults are not unduly restricted. Recently, at the urging of Senator Harkin and Center for Science in the Public Interest, language was included in the 2009 Omnibus Appropriations Act establishing an Interagency Working Group on Food Marketed to Children. Members of the task force include representatives of the FTC, FDA, CDC, and Department of Agriculture, with expertise in child nutrition, health, psychology, education, and marketing. The Working Group is to conduct a study and develop recommendations for standards for the marketing of food to children 17 years and under by July 15, 2010.8 It will be important for the policy community to have input into this process. Different entities use different thresholds for determining which youth need protection. The FCC's ad limits apply only to programming primarily intended for children 12 and under.9 Similarly, the Children's Online Privacy Protection Act (COPPA) applies to children under 13.10 The CBBB Initiative is limited to children under 12. The Interagency Working Group is charged with developing recommendations for food marketing targeting children up to age 17. Different methods have been used to determine whether media is targeted to or watched/used by youth. For example, the FCC's advertising limits apply only to "programs originally produced and broadcast primarily for an audience of children. "13 Many programs watched by large numbers of children, such as American Idol and The Simpsons, are not covered. Interactive marketing. In 2004, the FCC tentatively concluded that interactive marketing to children on digital TV was contrary to the public interest.17 Now that interactive marketing is becoming a reality, pressure could be put on the FCC to make its tentative conclusion final before the practice can become entrenched. This would set an important precedent. However, to be effective, the prohibition should apply to interactive marketing on all media, not just digital TV. It is not clear that the FCC has jurisdiction to regulate interactive advertising except on over-the-air TV broadcasting. Embedded advertising. In June 2008, the FCC began a review of its sponsorship ID rules, which generally require broadcast stations that air content paid for by advertisers to disclose the fact of the payment and who paid for it. The FCC asked if the rules should be updated in light of the increase in product placements and other "more subtle and sophisticated means of incorporating commercial messages into traditional programming." Specifically, it asked whether to eliminate the exemption for feature films on TV.18 The FCC noted that embedded advertising in children's programming would violate its separations policy19 , but proposed to adopt a rule expressly prohibiting embedded advertising in children's programs.20 The Campaign for a Commercial Free Childhood (CCFC) urged the FCC to expand the prohibition against embedded advertising to prime-time programs with a substantial child audience. Program length commercials. FCC policy has prohibited program length commercial (PLCs) targeted to children since 1974.26 However, the definition of a PLC was changed in the 1991, permitting a dramatic increase in licensing of children's characters.27 Advocates might consider asking the FCC to revise its definition of a PLC to recognize that when a character from a children's program is used to market food or other products, the entire program effectively becomes a commercial. Counter-ads. In the late 1960s, the FCC required that broadcast stations airing cigarette commercials air counter-messages about the health hazards of smoking.28 Similarly, the FCC (or Congress) could require TV stations running ads for unhealthy foods targeted to children to air an equal amount (or some other proportion) of counter-ads. This proposal raises a number of practical issues including how broadcasters would know whether an advertisement was for unhealthy food, who would produce the counter-ads, and whether broadcasters would have to air the counterads "for free." While more First Amendment-friendly than a ban, it is not clear that requiring counter-ads would survive constitutional scrutiny.29 Nor is it clear whether and how counter-ads would apply to non-broadcast media. Child safe viewing act report. In late 2008, Congress passed the Child Safe Viewing Act, which required the FCC to report by August 29, 2009, on technologies that parents can use to protect their children from "any indecent or objectionable video or audio programming," as determined by a parent, whether transmitted by wire or over-the-air.30 The Children's Media Policy Coalition proposed that commercials be rated so that parents could shield children from inappropriate commercials. Although the Children's Media Policy Coalition did not suggest that food advertisements be rated based on nutritional value, advocates could ask the FCC to include this idea in its Report. Given problems with the V-chip generally, however, it is not clear that parents would block junk food ads even if they could. COPPA rules. While COPPA provides some protection for children under 13, it can easily be evaded and has not kept up with recent developments that allow targeting of specific users even without personally identifiable information. The FTC recently announced that it would review the COPPA rule in 2010.32 Advocates need research to effectively comment on the shortcomings of the existing rules and propose improvements. Behavioral advertising guidelines. Behavioral advertising refers to the tracking of a consumer's activities onlineincluding searches conducted, web pages visited, and content viewedto deliver advertising targeted to the individual consumer's interest. After seeking public comment33, the FTC Staff issued five selfregulatory principles in February 2009. The principles generally require companies to give notice of the collection and allow consumers to opt out. For "sensitive data," including information about children's online activities, affirmative express consent is required before collecting the data.34 Commissioner (now Chairman) Leibowitz issued a separate statement suggesting that the targeting of ads to children based on their online activities should be prohibited outright. Commissioner Jones questioned the effectiveness of self-regulation generally. Thus, the FTC would likely be responsive to proposals for guidelines that would better protect youth from being unfairly targeted. Food marketing report. In July 2008, the FTC released its Report to Congress on "Marketing Food to Children and Adolescents. "39 After analyzing confidential information from 44 companies, the FTC found that over $1.6 billion was expended to promote food and beverages to children and teens in 2006. Traditional measured media, i.e., TV, radio and print, accounted for $852.9 million or 53% of the total.40 Companies spent $240 million (13%) on cross-promotions, and an additional $360 million for toys promoted with kids meals. Expenditures for new media, e.g., media-sponsored websites, Internet, digital, word-of-mouth, and viral marketing, represented the smallest category of expenditures (76.6 million or 5%), but the FTC noted that 2/3 of companies used the Internet to market to youth and that new media generally costs less. The FTC recommended ways to strengthen self-regulatory efforts and plans to issue a follow-up report assessing whether the recommendations have been implemented. It also plans to use its compulsory process to collect 2009 data for another report. Advocates may want to suggest ways that the FTC's data collection and study methodologies could be improved. Restoration of FTC rulemaking. In past Congresses, Senator Harkin introduced bills to restore the FTC's authority to adopt rules to prevent "unfair" marketing practices to children.43 Until its rulemaking jurisdiction is fully restored, the FTC is limited to less efficient case-by-case enforcement actions or encouraging less effective selfregulation. With new leadership at the FTC, the FTC would likely take advantage of its rulemaking authority if it is restored. Legislation on food marketing. A bill specifically addressing food marketing to youth would be the most direct way to address childhood obesity. It would be useful to develop a package of proposals for a model bill. Congressman Moran has a draft bill, not yet introduced, that could serve as a starting point.44 Other ideas include mandating that at least 50% of food advertising to children on TV be devoted to healthy food products45, eliminating tax deductions for junk food advertising, providing funding for social marketing to promote healthy eating and exercise, and funding more research concerning food marketing and obesity. Privacy bills. Privacy bills will likely be introduced in Congress this session. Although intended to address online privacy broadly, including behavioral targeting, they could include provisions preventing the collection and/or utilization of data to target young people. Food marketers in the CBBB Initiative, companies with children's websites46 , and companies that use behavioral marketing are subject to self-regulatory guidelines. Self-regulation works best when backed up by government regulation.47 It is also important the self-regulatory efforts are subject regular, independent oversight. If it can be shown that self-regulation is inadequate, it puts pressure on Congress and agencies to act and makes it easier to defend government regulation in a constitutional challenge. CBBB initiative. Many suggestions for improving the CBBB Initiative have been offered. These include having all companies that market food to children participate; requiring meaningful and consistent nutritional standards for what can be advertised; requiring meaningful and consistent definitions of marketing to children; applying the standards to all forms of marketing; and extending the guidelines to apply to youth older than 11. In addition, it has been urged that media companies such as Nickelodeon should agree to only air advertisements to youth that meet the nutritional standards and not to license their characters for use in marketing foods that do not meet nutritional standards. Other trade associations. Given the widespread practice of cross-promoting food and motion pictures, Advocates could urge the MPAA to limit these arrangements. Other trade associations, such as the Interactive Advertising Bureau, Cellular Telephone Industry Association, and Entertainment Software Ratings Board, could also be asked to expand their guidelines to limit marketing of unhealthy foods to youth. The FCC, FTC, Congress, and industry have many ways to limit food marketing, change the type of food marketed, and/or prohibit unfair or deceptive marketing to children and teens. This survey may help advocates make strategic decisions about how to best deploy their limited resources to achieve their goals. 1. Children's Television Report and Policy Statement, 50 FCC 2d 1 (1974). 2. See Jeff Chester & Kathryn Montgomery, Interactive Food & Beverage Marketing: Targeting Children and Youth in the Digital Age (BMSG May 2007); FTC, Marketing Food to Children and Adolescents: Review of Industry Expenditures, Activities, and Self-Regulation (July 2008). 3. In the 1970s, the FTC staff conducted an investigation in response to petitions from Action for Children's Television and the Center for Science in the Public Interest. FTC, Staff Report on Television Advertising to Children , 10-11 (Feb. 27, 1978). As a result, the FTC issued a Notice of Proposed Rulemaking proposing to (a) ban all TV advertising that is directed to or seen by children under eight years old because they are too young to understand the selling purpose of the advertising or otherwise comprehend or evaluate it; (b) ban TV advertising directed to or seen by children between the ages of eight and eleven for sugar products that pose a serious dental health risk; and (c) require that advertisements for sugared products be balanced by nutritional or health disclosures funded by advertisers. Children's Advertising Notice of Proposed Rulemaking, 43 Fed. Reg. 17967, 17968-69 (1978). The advertising and cereal industries lobbied heavily against these proposed regulations. Tracy Westen, Government Regulation of Food Marketing to Children: The Federal Trade Commission and the Kid-Vid Controversy , 39 Loy. L.A. L. Rev. 79 (2006). As a result, Congress passed a law repealing the FTC's authority to enact rules to prevent unfair advertising to children and imposing additional requirements on the FTC's rulemaking authority. Federal Trade Commission Improvements Act of 1980, Pub. L. No. 96-252 (codified in part at 15 U.S.C. 57a(h)). 4. McGinnis M., Gootman J., Kraak V. Institute of Medicine. Committee on Food Marketing and the Diets of Children and youth. Food marketing to children and youth: Threat or opportunity? Washington DC: National Academies Press, December 2005. 5. Although a discussion of the First Amendment issues is beyond the scope of this paper, it should be considered in developing strategies. 6. In July 2005, the FTC held a joint workshop with HHS to address the alarming rise in childhood obesity and to analyze what food and media companies could do to help combat the problem. Industry representatives, including the Children's Advertising Review Unit (CARU), a unit of the Council of Better Business Bureaus (CBBB), showcased their efforts and described their plans to improve the self-regulatory process. Children's advocates contended that both the industry and the FTC needed to be more proactive. In April 2006, the FTC released a report summarizing the workshop and concluding that the CBBB/CARU should be given time to develop and implement changes before considering alternatives. It recommended that CARU expand its advisory board to include experts on nutrition, child health, and psychology, evaluate the adequacy of CARU's resources, modify the CARU guidelines to include nutritional standards for foods marketed to children, and limit product placements. The FTC also urged media companies to review and revise practices to foster licensing of characters for use with more nutritious products. FTC, Marketing, Self-Regulation & Childhood Obesity (April 2006). CARU hired a former head of the FTC's Bureau Consumer Protection to review its practices and announced revisions in November 2006. At the same time, CBBB created the Children's Food & Beverage Advertising Initiative (CBBB Initiative). At the FTC's workshop in summer 2007, the CBBB Initiative released the pledges of its 11 member companies, which collectively account for about 2/3 of food advertising to children under 12. Currently, 13 companies have made pledges: Burger King, Cadbury Adams, Campbell Soup, Coca-Coal, ConAgra, General Mills, Hershey, Kellogg, Kraft, Mars, McDonalds, Pepsico, and Unilever. Participants must agree to: (1) devote at least half of their advertising directed to children under 12 on TV, radio, print, and the Internet to "better for you" products or messages that encourage good nutrition or healthy lifestyles; (2) reduce the use of third-party licensed characters to market to children under 12 except for "better for you" foods or in messages that promote a healthy lifestyle; (3) cease product placements for food and beverages in content directed primarily to children under 12; (4) and incorporate "better for you" foods or healthy lifestyle messages in interactive advertising games that integrate a company's food or beverage. The details of each company's pledges, however, can vary significantly. For example, Kraft pledged not to advertise at all to children under 6, while McDonalds pledged to limit its advertising to children under 12 to meals with a maximum of 600 calories, 35% of calories from fat, and 35% total sugar by weight. In July 2008, the CBBB Initiative released a report analyzing the compliance of the 6 companies with pledges that had been in effect from July to December 2007. It found that all companies substantially complied with their pledges and that any problems were relatively minor and had been resolved. The CBBB Initiative committed to report annually on whether participants were complying with their pledges. CBBB, Changing the Landscape of Food & Beverage Advertising: The Children's Food & Beverage Advertising Initiative in Action (July 2008). 7. For example, General Mills' cereals Cocoa Puffs, Cookie Crisp, and Lucky Charms meet its nutritional criteria and can be advertised to children without limit. 8. Omnibus Appropriations Act, 2009, Pub. L. 111-8, Committee Print on H.R. 1105 (Legislative Text and Explanatory Statement) at 983-984 (March 10, 2009). 9. 47 C.F.R. 73.670, note 2. 10. COPPA directed the FTC to adopt rules requiring that websites directed to children under 13 obtain parental consent prior to collecting personal information from children. The FTC's rules, which were adopted in 1999, may be found at 16 C.F.R. Part 312. 11. See, e.g. . Agnes Nairn and Cordelia Fine, Who's messing with my mind? The Implications of dual-process models for the ethics of advertising to children , 27 Int'l J. of Advertising, 447-470 (2008); Cornelia Pechmann, et al., Impulsive and Self-Conscious: Adolescents' Vulnerability to Advertising and Promotion , 24 J. of Public Policy & Marketing 202 (2005). 12. For example, COPPA's requirement that websites obtain parental permission before collecting personal information from children may not be practical or desirable for teens. 13. 47 C.F.R. 73.670, note 2. 16. For example, Coca-Cola defines advertising primarily directed to children as advertising on any media when 50% or more of the audience is composed of children under 12, while Mars considers child-directed media as any media with 25% or more of the audience under age 12. Instead of using audience share, Pepsico analyses 5 factors, no single one of which is controlling. The factors are (1) whether the content of the media is designed for children under 12, (2) whether the advertised product or service is intended for use by, or is of interest to, children under 12, where the media in the advertising is promoted and advertised; available projections, at the time the advertising is place, of audience demographics; and for TV programs, whether they are aired during what is generally understood to be children's programs. 17. Children's Television Obligation of Digital Television Broadcasters , 19 FCC Rcd 22943 (2004). The FCC concluded that prohibiting direct links to websites "at least at this stage in the digital transition is premature and unnecessary and could hamper the ability of broadcasters to experiment with potential uses of interactive capability in children's programming." Nonetheless, the FCC noted that "the inclusion of interactive technology in TV programming is on the horizon" and creates "risks that children will be exposed to additional commercial influences." It tentatively concluded that it should "prohibit interactivity during children's programming that connects viewers to commercial matter unless parents 'opt in' to such services." At the same time, it sought additional comment on whether to adopt a rule and how such a rule might be implemented. Even though comments were filed and the digital transition is scheduled to be completed as of June 12, 2009, the FCC never issued a final order in this proceeding. 18. Sponsorship Identification Rules and Embedded Advertising , 23 FCC Rcd 10682 (2008). This exception was created at a time when few motion pictures were broadcast. That is no longer true. In addition, product placement is much more common today, even in films intended for children. 19. The separations policy adopted in 1974 states that "basic fairness" requires a clear separation between program content and commercial messages. 50 FCC 2d at 16. As a result, it became common practice for TV stations to air "bumpers," e.g ., "we'll be right back after these commercial messages," to clearly delineate when the program is interrupted by a commercial. 20. Sponsorship Identification Rules and Embedded Advertising , 23 FCC Rcd 10682 at 16. A rule is stronger than a policy because it is more difficult to repeal. The Children's Media Policy Coalition (CMPC) supported the FCC's proposal to convert the policy into an explicit rule and to clarify that it would apply to cable and satellite as well as broadcast TV. 23. Congressman Markey also suggested that the FCC disqualify children's educational programming that contained advertisements for unhealthy food. Even if adopted, this proposal would have little impact since most broadcast TV stations only provide 3 hours of children's educational programming each week. 24. After holding several public meetings, the Task Force announced that it would issue its report in September 2007. However, no report was ever issued and the Task Force disbanded. According to Patti Miller, a member of the Task Force who was at the time Vice-President of Children Now, four issues prevented the industry representatives and children's and public health advocates from reaching a resolution. First, the children's and public health advocates wanted a uniform nutrition standard for food marketing to children. Second, they wanted the food/beverage companies to eliminate the "loophole" that allows non-nutritious food be categorized as "better for you." Third, they wanted the children's' media companies to act as gatekeepers in monitoring food advertising on their channels and networks. Finally, they wanted the media companies to commit to meaningful restrictions on the kinds of food that could be marketed using their licensed characters. The industry representative generally felt that they had already made significant concessions in the food marketing pledges and were not willing to do more. 25. Commissioner Copp's letter also mentioned that the FCC could explore mandatory counter-messaging and further restrictions on use of licensed characters and product placements. Advocates might also ask the FCC to examine whether it has authority to limit advertising to children and teens using other platforms subject to FCC regulation such as broadband and mobile telephones. 26. 1974 Policy Statement, 50 FCC 2d at 17. 27. In 1991, the FCC changed the definition of a PLC to a program associated with a product in which commercials for that product are aired. Thus, for example, a commercial for a Pokemon game during or adjacent to the Pokemon program would cause the program to be considered a PLC, but the mere fact that toy or product was interwoven into a program would not cause the program to be considered a PLC. Children's Television Programming , 6 FCC Rcd 2111, 2118, recon. granted in part , 6 FCC Rcd 5093, 5098-99 (1991). Just recently, Hasbro, a major toy manufacturer, announced it would be entering into a joint venture with Discovery Communications to create a children's channel to air programs based on its brands. Even though this venture is clearly intended to promote Hasbro products, it does not violate the FCC's narrow definition of PLCs, and thus demonstrates why the current rules are inadequate. Although this example does not involve food, many years ago Frito-Lay planned to produce a children's show featuring Chester Cheetah. It abandoned these plans after the Center for Media Education filed a petition asking the FCC to declare that the program would be contrary to the public interest. 28. Banzhaf v. FCC , 405 F.2d 1082 (D.C. Cir. 1968). Subsequently, Congress passed the Cigarette Act of 1969, which prohibited the broadcast of cigarette advertisements. See Capital Broadcasting Co. v. Mitchell , 333 F.Supp. 582 (D.D.C. 1971), aff'd, 405 U.S. 1000 (1972). The tobacco industry supported the Cigarette Act's ban on advertising because the anti-smoking messages required by the FCC ruling had proven to be extremely effective, resulting in a trend toward lesser cigarette consumption. Id. at 587 (Wright, J. dissenting). 29. Although FCC's cigarette counter-ad requirement was upheld in Banzhaf , that case was decided at a time when commercial speech was afforded less First Amendment protection than today. Moreover, the courts have many more conservative judges today. Because the FCC's cigarette decision was based on the now repealed Fairness Doctrine, adopting a similar rule for junk food ads would face substantial political oppositions from the right claiming that the FCC was readopting the Fairness Doctrine. 30. The Child Safe Viewing Act of 2007, Pub. L. No. 110-452, 122 Stat. 5025. 31. A National Broadband Plan for Our Future, Notice of Inquiry, GN Docket No. 09-51, rel. Apr. 8, 2009. 32. FTC Staff Report, Beyond Voice, Mapping the Mobile Marketplace 3 (April 2009). 33. A coalition of child advocacy organizations filed comments urging that all data collected about the online activities of teens as well as children be considered sensitive. They argued that teens are unable to provide meaningful consent due to their susceptibility to peer pressure, difficulty understanding long term consequences of their behavior, and the complexity of disclosure statements. Children's advocates further argued that the guidelines should prohibit the collection of such information as an unfair and deceptive practice. They also urged the FTC to update its COPPA rules to clarify that the use of persistent identifiers (such as customer numbers held in cookies) to collect information to send individual children highly targeted ads clearly fits within the statutory definition of "personal information" requiring parental consent. Comments of American Academy of Child and Adolescent Psychiatry, the American Academy of Pediatrics, American Psychological Association, Benton Foundation, Campaign for a Commercial Free Childhood, Center for Digital Democracy, Children Now, and the Office of Communication of the United Church of Christ, Apr. 11, 2008. 34. FTC Staff Report: Self-Regulatory Principles for Online Behavioral Advertising (Feb. 2009) 44,47, available at http://www.ftc.gov/0s/2009/02/P085400behavadreport.pdf. Prior to issuing this report, the FTC held a two-day town hall meeting on behavioral advertising at which Internet content providers, online advertisers, privacy groups, and consumers discussed the benefits and risks associated with behavioral targeting and potential actions that the parties or the government could take to ameliorate some of the perceived harms. Soon thereafter, the FTC staff sought comment on five proposed self-regulatory principles to guide the industry. FTC, Online Behavioral Advertising: Moving the Discussion Forward to Possible Self-Regulatory Principles , (2007) , http://www.ftc.gov/os/2007/12/P859900stmt.pdf. 35. Under 5 of the Federal Trade Act, the FTC may bring actions to prevent "unfair or deceptive acts or practices in or affecting commerce." 15 U.S.C. 45(a). 36. This is essentially what happened in 1996 when Center for Media Education filed a compliant alleging that the Kidscom website was engaging in deceptive and unfair practices. The FTC staff's agreement with the analysis in the complaint helped lead to the passage of COPPA. 37. Commercial Alert filed one complaint alleging that product placements were deceptive and another that "buzz marketing" was deceptive. Buzz marketing, also known as "word-of-mouth," "guerrilla" or "stealth" marketing, describes a technique in which corporations pay people (including children and teens) to endorse their products in an effort to influence buying decisions by others. In February 2005, the FTC staff issued a letter declining to require greater disclosure of product placements. It explained that "[i]f no objective claims are made for the product, then there is no claim as to which greater credence could be given; therefore, even from an ordinary child's standpoint, consumer injury from an undisclosed paid product placement seems unlikely." In December 2006, it declined to take action against buzz marketing. However, the letter acknowledged that if the failure to disclose the relationship between the marketer and the endorser would materially affect the weight or credibility of the endorser, i.e., if consumers would not reasonably expect that relationship, it could be deceptive. In both cases, the FTC invited Commercial Alert and other members of the public to bring specific instances of deceptive product placements and deceptive word-of-mouth marketing to its attention for case-by-case enforcement. 38. For example, some advertising and packaging use language or graphics to suggest that a product is healthy when it is not. See, e.g., Leslie Mikkelsen, et al. Where's the Fruit? Fruit Content of the Most Highly-Advertised Children's Food and Beverages (Prevention Institute Jan. 2007). 39. FTC, Marketing Food to Children and Adolescents: Review of Industry Expenditures, Activities, and Self-Regulation (July 2008). In his Concurring Statement, then Commissioner Leibowitz expressed concern about the large amounts of money expended to market carbonated beverages to teens, nearly $20 per teen, and the $520 million for advertising and toys for fast food meals. While generally praising the CBBB Initiative, he urged that the pledges apply to all forms of marketing directed at children, including packaging, point-of-sale, and other promotions, that CBB adopt standards for healthy dietary choices, adopt a more appropriate standard for measuring a child audience, and implement a reliable system of monitoring. 40. This figure did not take into account advertising on such programs as American Idol, Family Guy and The Simpson, because they did not have a large enough proportion of youth in the audience, even though millions of children and teens watch them. 41. FTC Staff Report, Beyond Voice, Mapping the Mobile Marketplace 3 (April 2009). 42. Complaint and Request for Inquiry and Injunctive Relief Concerning Unfair and Deceptive Mobile Marketing Practices, filed Jan. 13, 2009. The complaint, which the FTC has not yet responded to, details why teens present an attractive target for mobile marketers and provides examples of such targeting at 32-37. 43. Healthy Lifestyles and Prevention American Act ("HeLP Act"), S. 2558, 108th Cong. 302 (2005). See also H.R. 2278, 110th Cong., (2007)(introduced by Eleanor Holmes Norton). 44. This draft bill would create an Office of Childhood Overweight and Obesity Prevention and Treatment within the Department of Health and Human Services. Its responsibilities would include consulting with the Department of Agriculture to identify three categories of food and beverages: 1) healthful, consumption should be encouraged; 2) acceptable in a healthful diet for children and adolescents; and 3) not healthful, consumption should be discouraged. For each category, the Office would develop, in conjunction with the FTC, guidelines for marketing to children and adolescents that take into account their emotional vulnerability and cognitive ability as well as society's interest in protecting the health and well-being of its children. No later than three years after the issuance of these guidelines, the FTC would be required to promulgate rules, after notice and comment, defining advertising, promoting and marketing directed at children and youth including the age of the intended audience and the medium used; and to specify categories of food and beverages for which any advertisement, promotion or marketing to children and youth would be an abusive, unfair or deceptive practice. 45. Watch What you Eat: Food Marketing to Kids: Joint hearing before the Subcomm. on Labor, Health and Human Services, Education, and Related Services and the Subcomm. on Financial Services and General Government, Senate Comm. on Appropriations, 110th Cong., 2nd Sess. 73 (Sept. 23, 2008)(testimony Patti Miller, Vice President of Children Now). 46. The FTC rules implementing COPPA include a "safe-harbor" regime, in which self-regulatory organizations such as CARU, ESRB and TRUSTe review and certify compliance with the rules and refer violators to the FTC. 47. Angela J. Campbell, Self-Regulation and the Media , 51 Fed. Comm. L. J. 711 (1999).